The natural curves of our body may need protection from being chafed. Both exercise and skin rubbing against skin or clothing can cause chafing. Hormonal imbalances during puberty, pregnancy or menopause can cause excessive sweating which can cause chafing. Stress can cause excessive sweating which can cause chafing. Our sensitive skin needs that extra love and care once it becomes chafed. Chafe prone skin is not an issue due to specific body frames, body weight or skin colour – simply, like acne prone skin, some people have chafe prone skin. Why wearing shorts or tights underneath a dress is not the answer for some chafe prone skin. For some women shorts or tights underneath a dress in order to stop chafing is not an option. Gynaecologist’s recommend that women wear natural fibres in their underwear. For women who suffer from chronic thrush they must allow their bodies to breathe and therefore nylon or other manmade fibres near their bikini line should not be worn as this can harbor infection. Antiperspirants should not be used in the attempt to prevent chafing. Antiperspirants have been used in the attempt to prevent chafing. The reasoning is that an antiperspirant will stop the sweat and if sweat glands are blocked then chafing or a rash will not occur. If there is broken skin an antiperspirant can increase the chances of skin irritation and thus skin infection. Why the ingredient, aluminium chlorohydrate is not used in our chafing product? Aluminium chlorohydrate is the active ingredient in antiperspirants. Aluminium chlorohydrate plays the major role in blocking sweat pores, so that water will not be released from the body. Although sweating occurs all over our body, the main sweat glands are in the underarm pits and the groin. In order to avoid thigh chafing, some ‘anti-chafe’ products contains aluminium chlorohydrate so that the thighs stop sweating. But the major sweat glands are in your groin and therefore how can you prevent the sweat from running from your groin to your thighs? Hence, at LAJOIE SKIN our approach to help prevent chafing, is not to block pores and stop the natural process of sweating, but to assist the skin to glide by creating a protective barrier. Why no fragrance and essential oil? Although fragrance is one of our greatest passions here at LAJOIE SKIN, our product, Calmmé does not contain fragrance nor essential oils. The reason why Calmmé does not contain fragrance or essential oils, is so that we can reduce the potential of allergens and irritation. Chafe prone skin is sensitive and often the skin can crack or split, hence we do not want essential oils or fragrance penetrating the skin wall, as this will further irritate the skin. Secondly, you really don’t want your chafe cream to clash with your favourite perfume. 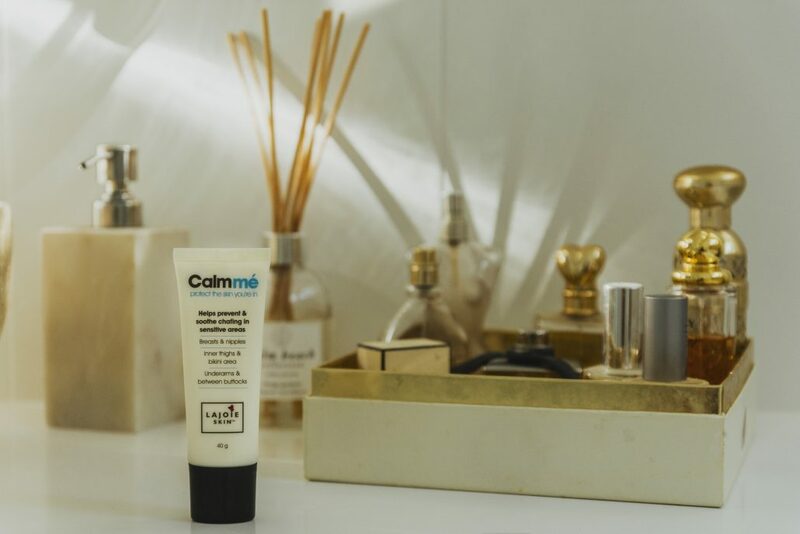 Calmmé is a functional product, meaning it’s primary role, is to do a job and that is to either help protect or soothe your skin. Why parabens and paraben derivatives are not used in our product? Parabens and Paraben derivatives are used in products as a cheap form of preservative ingredients. Preservatives are important in cosmetics as they protect consumers from harmful pathogens that would otherwise invade the creams and products people use on a daily basis. Without preservatives all cosmetics would have a very short shelf life and would, in the most part, have to be stored in a fridge. Parabens and paraben derivatives, provide value for money to you the customer. The problem with parabens and their derivatives is their potential leakage into the body through the skin’s surface. Hence, here at LAJOIE SKIN we would prefer to be extra cautious and not use parabens or paraben derivatives in our formulae. Why palm oil or palm oil derivatives are not used in our product? Palm oil and palm oil derivatives are cheap ingredients and therefore they are value for money for the manufacturer and the customer. However, palm oil and palm oil derivatives are costly to our environment and especially to the habitat of Orangutan. The palm oil industry is linked to major issues such as deforestation, habitat degradation, climate change, animal cruelty and indigenous rights abuses in the countries in which it is produced. Here at LAJOIE SKIN we do not use palm oil or palm oil derivatives. Having said that, there is a current move to produce palm oil from sustainable sources. But at this stage it is far too complicated for the consumer to guarantee which palm oil and its derivatives is sourced both sustainable and ethically. Our tube is designed to reduce cross contamination between your skin and the product. Bacteria is easily transferred from your skin and back into the product via its packaging. When a product is dispensed from a tube the chances of contamination are reduced. Conversely, when a stick is used to apply product to your skin, ‘bits of your skin’ are left behind on the surface of the stick and this increases the chances of bacterial contamination. You have better control of how much product to use and so there is less wastage. Easier to apply on areas were the skin is soft and not firm. Compact and therefore easily carried and stored in luggage. As the formulae is highly concentrated, a little goes a long way. Minimal packaging is required and it is light in weight. In order to achieve these benefits for our customers, we have had to use a mixture of different plastics. Polypropylene (PP) (5) is used on the lid which is not recycled by the majority of councils in Australia. High density polyethylene (HDPE) (2) is used on the tip of the tube, which should only be recycled if it is thoroughly clean and all of the actual product is removed. Low density polyethylene (LDPE) (4) is used on the body of the tube. which should only be recycled if it is thoroughly clean and all of the actual product is removed. Why talcum powder is not the answer to chafing? Apart from the fact that talcum powder is messy and provides a short term barrier to prevent chafing, it has been linked to cancer. Having said that, it is not clear if consumer products containing talcum powder increase cancer risk. Studies of personal use of talcum powder have had mixed results, although there is some suggestion of a possible increase in ovarian cancer risk. There is very little evidence at this time that any other forms of cancer are linked with consumer use of talcum powder. Until more information is available, people concerned about using talcum powder may want to avoid or limit their use of consumer products that contain it. Hence, here at LAJOIE SKIN we are being extra cautious and have not included talcum powder into our formulae. Why Vaseline does not provide a long term answer? Is short lived as it does not last for too long. Makes a mess of your valuable clothing and surroundings. Does not contain ingredients that will help soothe your skin. Feels slimy and oily to the skin. Is it natural? This is one of the most commonly asked questions by women with reference to skincare and cosmetic products. For details please go to, Is it natural? Facts behind ‘natural’ product claims.